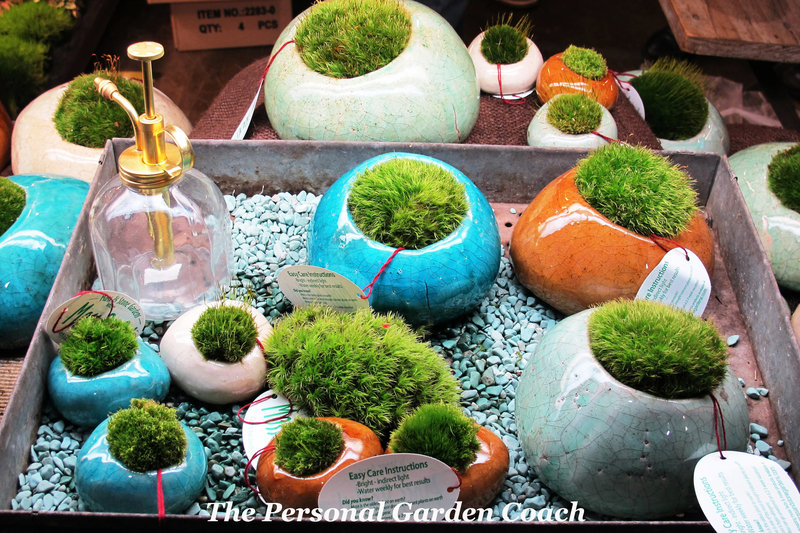 10 Things You Didn’t Know About Hiring a Personal Garden Coach! Enthusiasm for gardening is easy to acquire every single spring when you begin to see the first little plants start to line the front of the grocery store entryway. 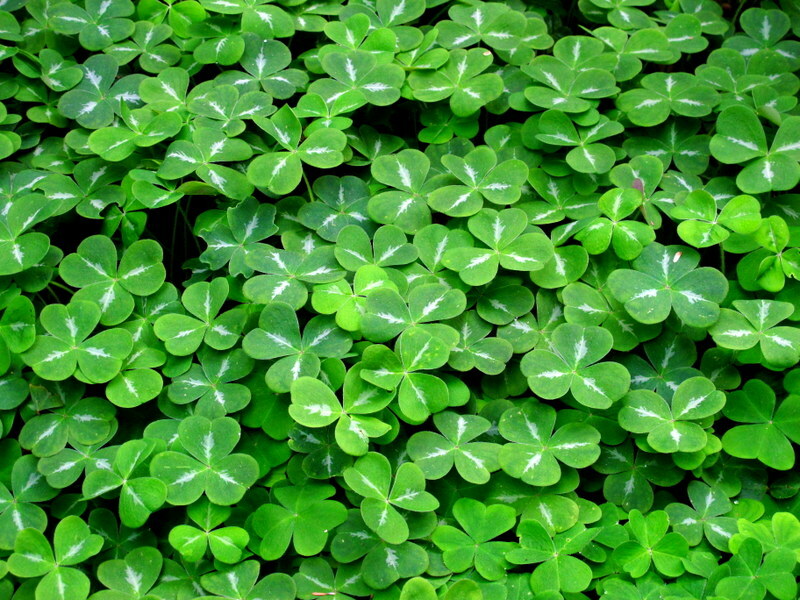 St. Patrick’s Day is almost upon you, here put this super cute clover on your desk at work and watch it…die. 😦 Easter is coming and there are those fragrant, gorgeous Easter Lilly’s at every turn. YES!! Let’s get one of those for the kitchen window and enjoy the blooms…until it dies. See a theme here? But its SPRING! 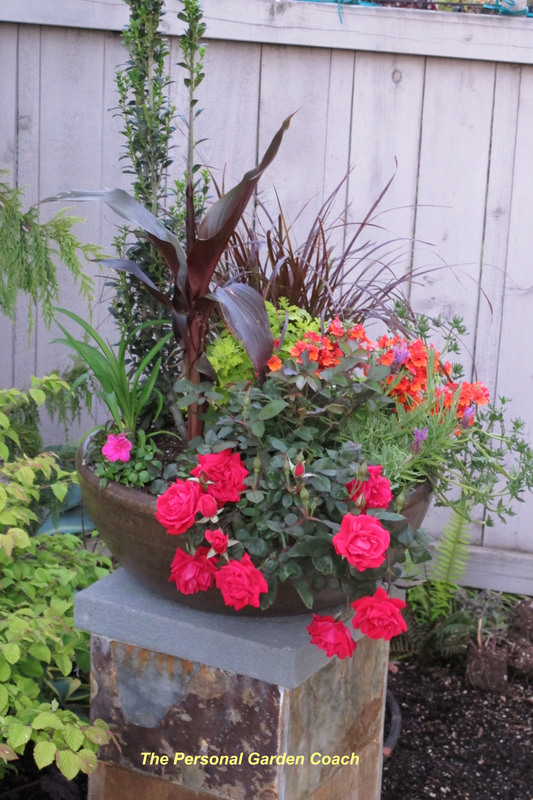 You simply feel compelled to head to the Big BOX store and buy a flat cart load full of soil, mulches, fertilizers and dozens and dozens of plants. You eagerly roll up to the cash register pay for your loot and take it home. Now what? PLANT! We’re weekend warriors, we can DO this! Dump those bags of soil out, plant that one over there, that one the other side and zippity-doo-dah, you are very nearly the definition of a PRO-Gardener. You sprayed the fertilizer of green liquid just like the commercial, sat down, had a cold adult beverage and admired your handiwork while you called your friends and invited them over for a barbecue to admire your horticultural feats. Now its a month later, your plants are either dead or they look really sad. What? No one at the Big BOX store told you that those were actually not hardy OUTSIDE in your area? They may have also failed to mention that those pretty little flowers you were SO excited about are chock full of disease that will kill them quickly and the store knowingly sold them anyway? OUCH! They didn’t mention when you were shopping that you were buying “Potting Soil” for your perennial beds when you really needed a compost mix? The fertilizer you bought and sprayed all over everything with abandon not only isn’t organic for your edibles but you used 6X the recommended amount and now they have all turned black? What happened? You went out with all of the very BEST intentions, but once again, you feel like you failed because it all turned out wrong. How come it doesn’t look like the magazines or all of the pictures on Pinterest? It’s NOT your fault! It’s because you need a “Horticultural Hand-Holder”! Seriously, you’ve heard of people using Career Coaches, Nutritionists to help with a diet, or a Fitness Coach right? How about a Personal Shopper? Personal Chef? Dog Trainer? The bottom line is that we are all busy and you simply can’t be expected to have the time or inclination to be an expert at everything. And just like anything else, learning about YOUR garden takes time. 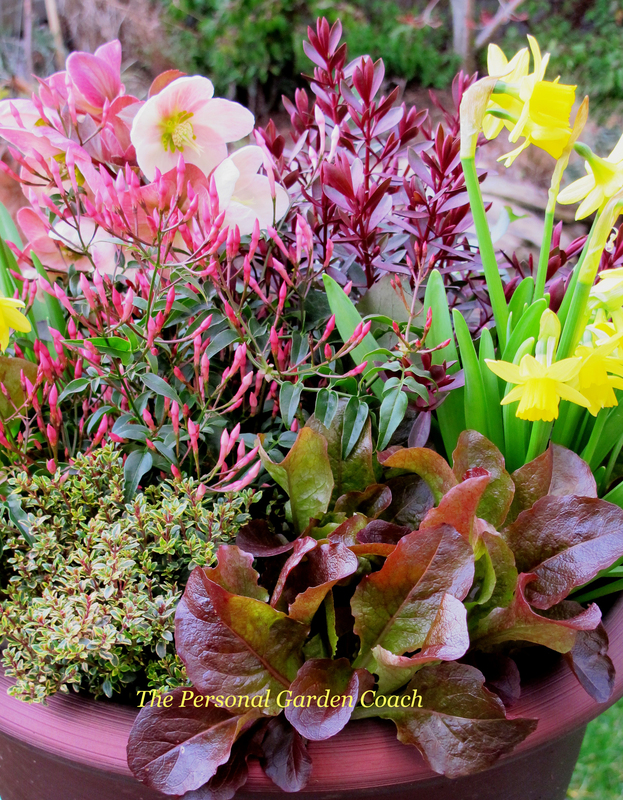 Why not take the step to hire a Personal Garden Coach? Don’t be intimidated, just dive in, the beauty is that YOU set the pace. Once per month, once per season, twice a year, it all depends on what goals you have in mind for your landscape and what YOU intend to get out of it. 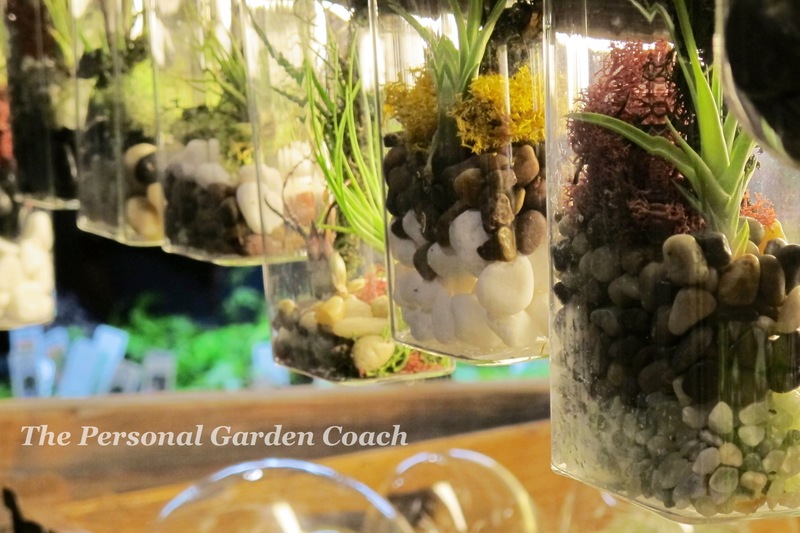 A Personal Garden Coach has the goal of saving you MONEY, TIME and, LABOR. 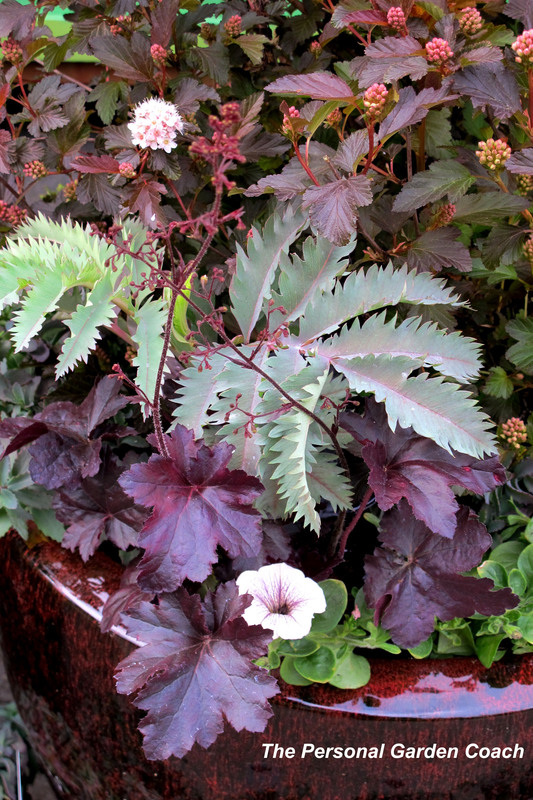 By making informed decisions when you are shopping for plants, and hard-goods likes soils, fertilizers and tools. We have tried them ALL and made the mistakes for you. WE know who good vendors are, we know what products are worth spending a little bit extra on and even more important, we can help you save where it makes sense to save. 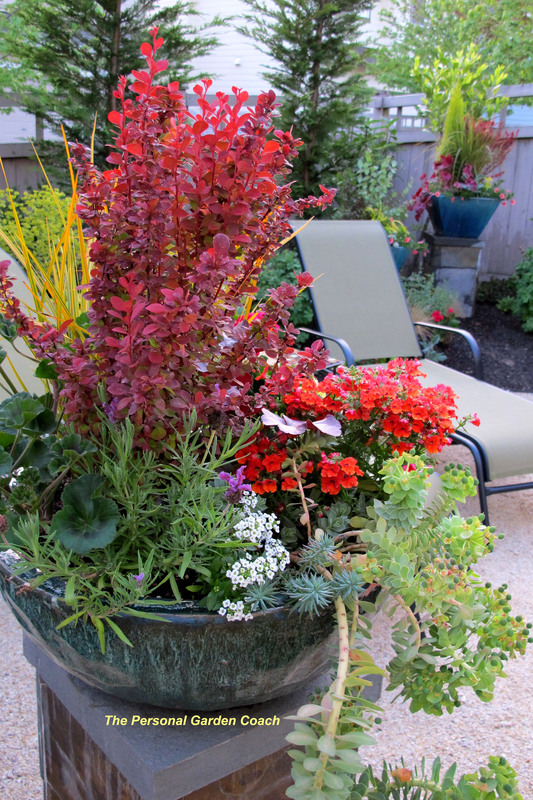 By doing it right the first time, you aren’t wasting valuable time that you can be using to ENJOY your landscape. We want to see you succeed and eventually not need us anymore! 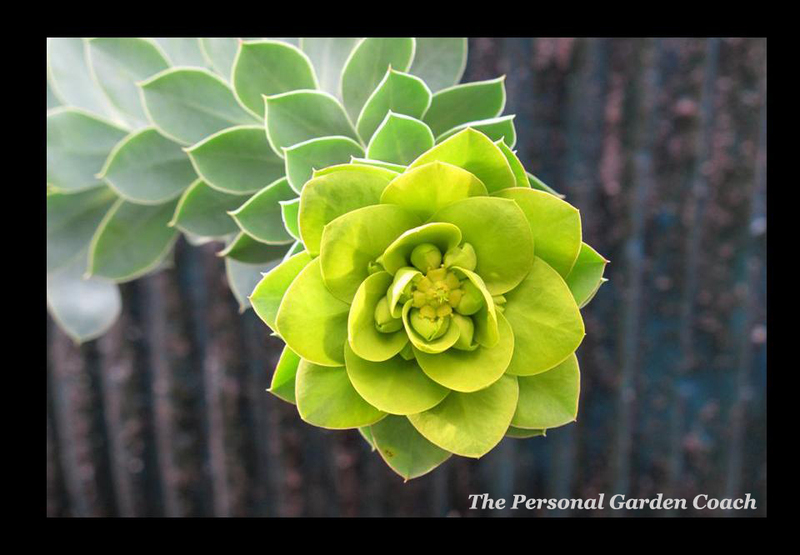 A Personal Garden Coach wants you to find the PASSION in plants and gardening, not the drudgery. 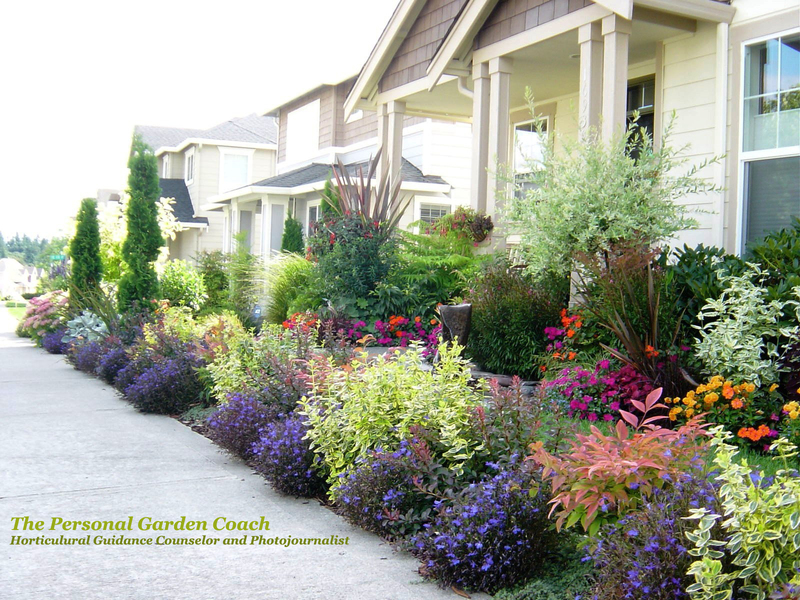 A Personal Garden Coach is on the journey with you, there WILL be mishaps. A plant WILL fail, a storm will happen at the wrong time, animals WILL cause problems. But, learning how to handle those issues as they happen is part of learning. 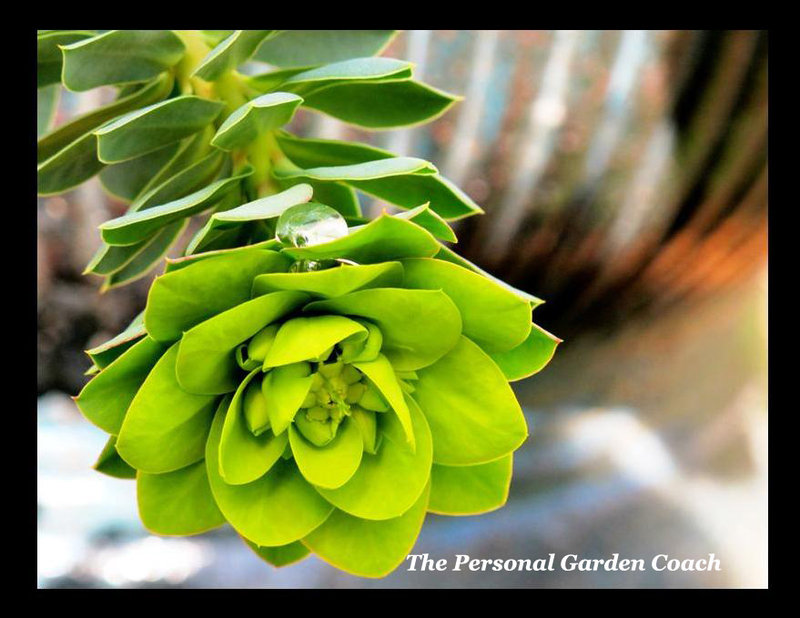 A Personal Garden Coach is there to cheer you on to try NEW things that you might not have considered before. 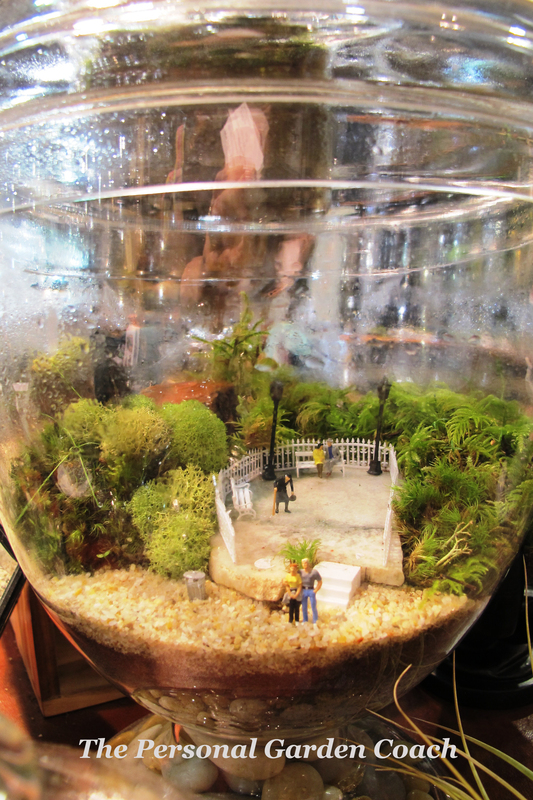 Want to create a fantasy miniature garden? Why not? 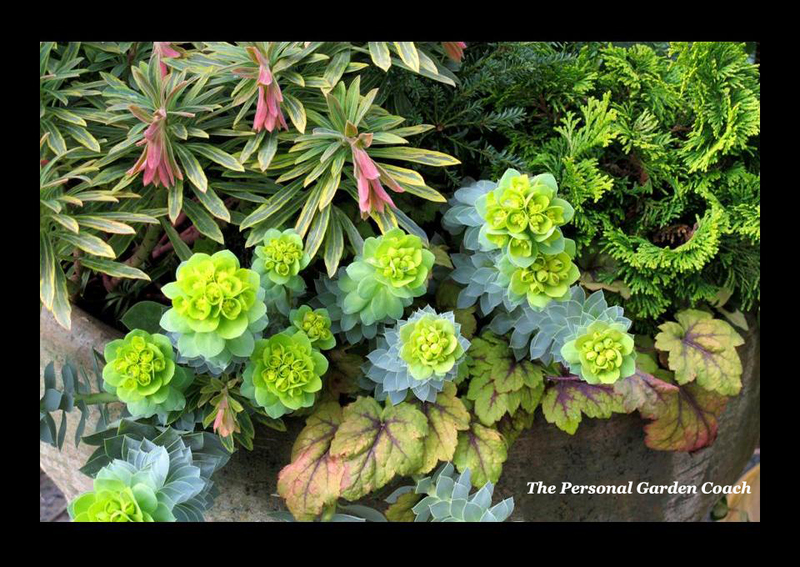 A Personal Garden Coach is also the FIRM hand of reason. You want to begin collecting $1000 Koi fish? Maybe we should try our hand at building a self enclosed fountain first? A Personal Garden Coach is going to help you decide on your best options for that new Hot Tub and Patio you have always wanted- need a subcontractor, a Personal Garden Coach is going to help you find one. Feeling the need to Prune? 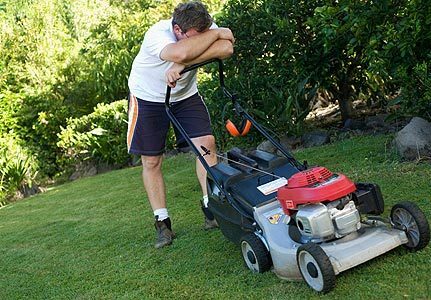 A Personal Garden Coach is going to teach you how to properly to avoid situations like this one. Is your dream to have a sustainable vegetable garden and homestead for chickens? 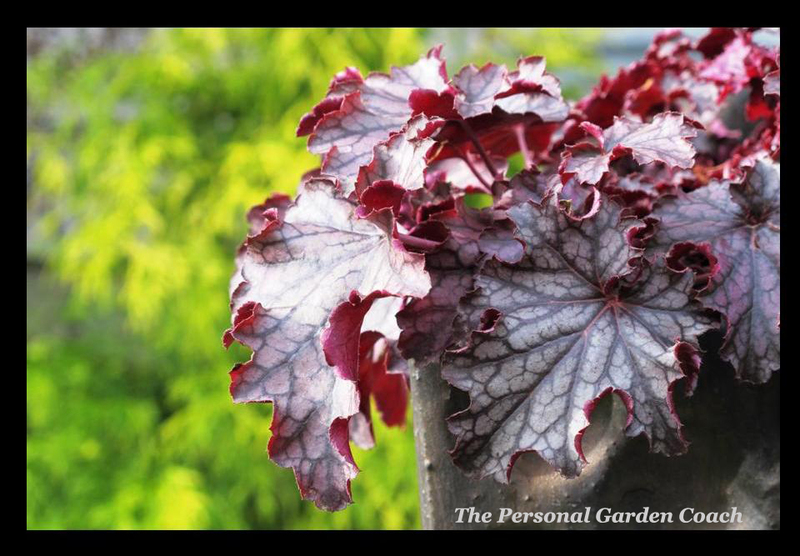 A Personal Garden Coach can help with that too! Got a fruit orchard and need help learning what to do with it all? 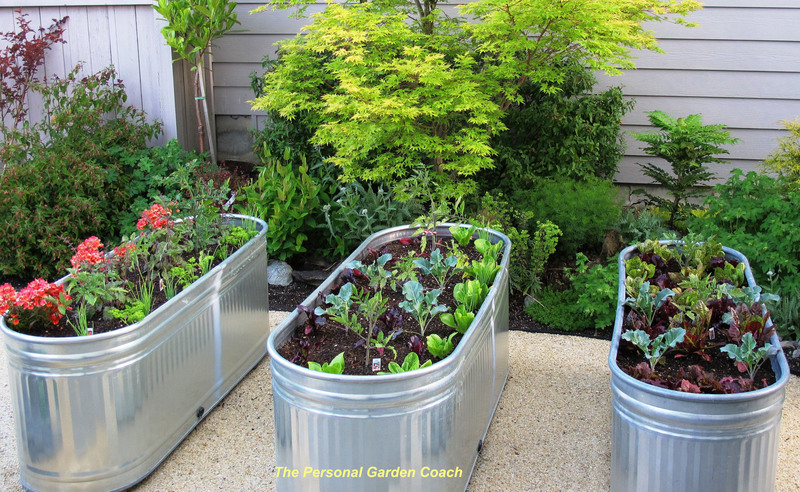 A Personal Garden Coach is your foodie growing and preserving ally! See? You CAN do this, don’t just settle for bland when your garden and landscape can be your proudest achievement without nearly as much expense and personal inner turmoil as you might have thought. Please do me the honor of sharing it with friends. And if you are on Facebook, you can find LOTS of neat info every day right here too! Here are some pics from the garden today. 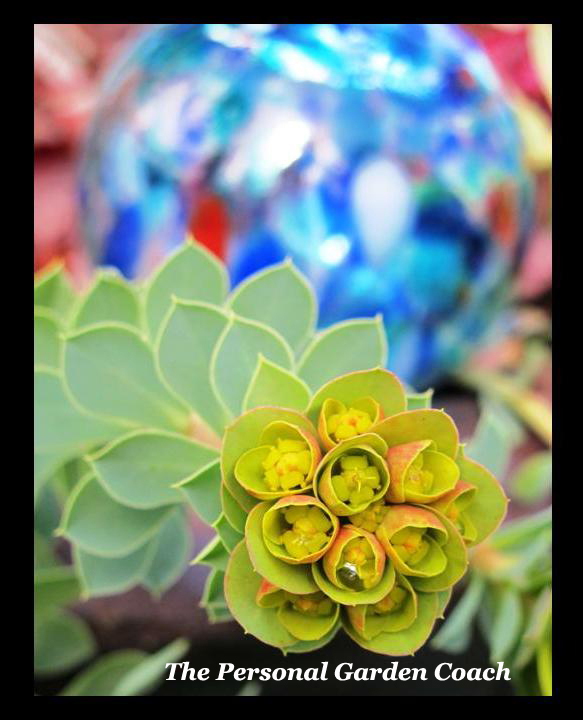 Clearly, my Euphorbia’s of ALL flavors are glorious in their Pre-Easter nodding fashion. 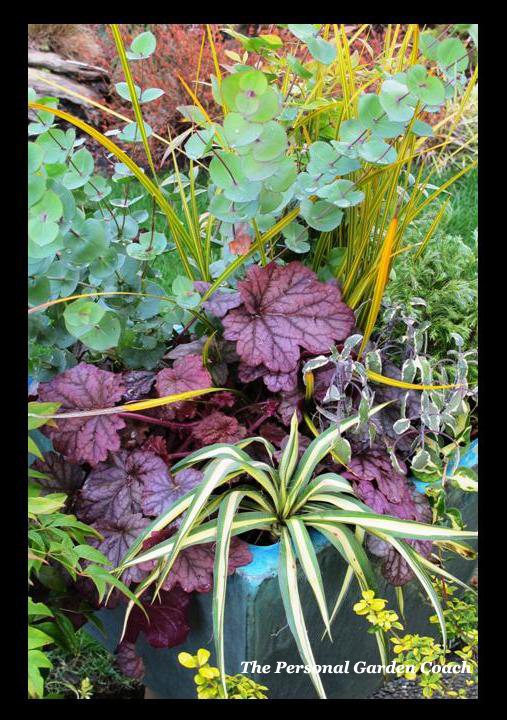 The Hebe’s and Heuchera are pulling their weight too, and my winter container designs are quite striking in the early spring sun. I’m not sure how much of a hurry I may be in to trade them in just yet. Enjoy! This jaded, cynical designer has a short attention span for the same old same old. 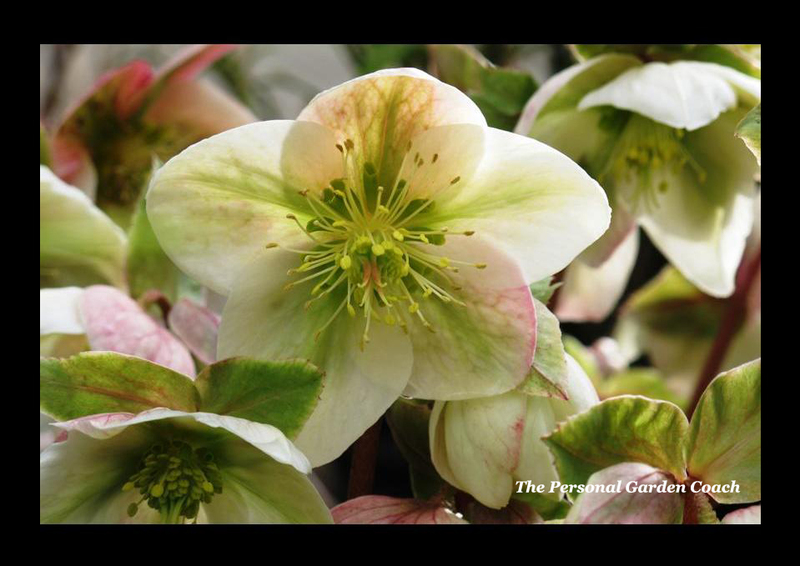 I am frequently yearning to see something new and inspirational in the world of gardening. So, one of the things I look for when I spend time at a large garden show like the Philadelphia Flower Show is a creative new discovery. I was fortunate to have stumbled on more than one AND HOW, at this show! 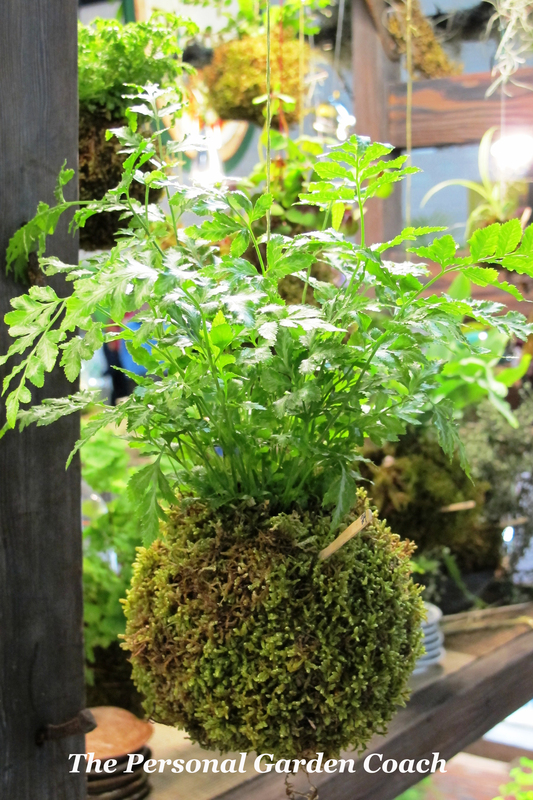 The “String Garden” or “Kokedama” was one of the hottest trends that I saw at the show. To be accurate, anything you could hang with a plant and a string was HOT! 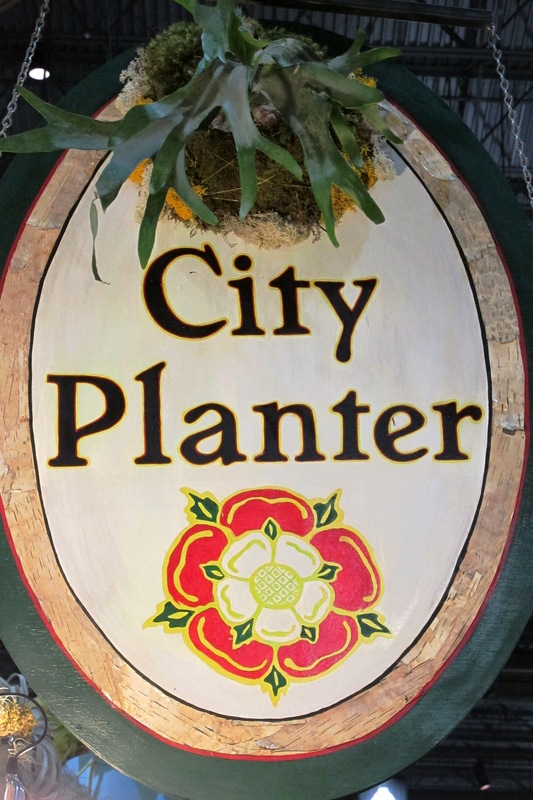 One fantastic vendor, City Planter is a very popular urban garden store in Philadelphia. They had a funky booth selling this latest whimsical trend among many others that made them a hot destination at this impressive 10 acre sized show. 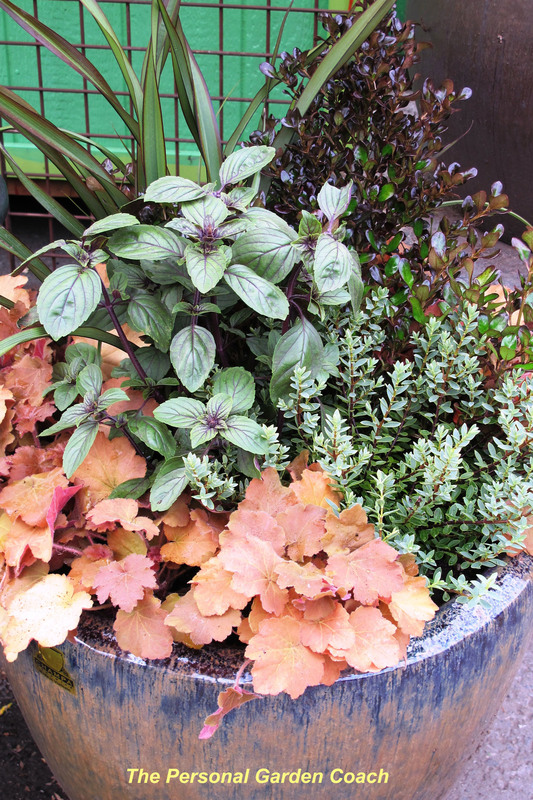 The City Planter shop featured these stylish string gardens for customers to see right out at eye level. 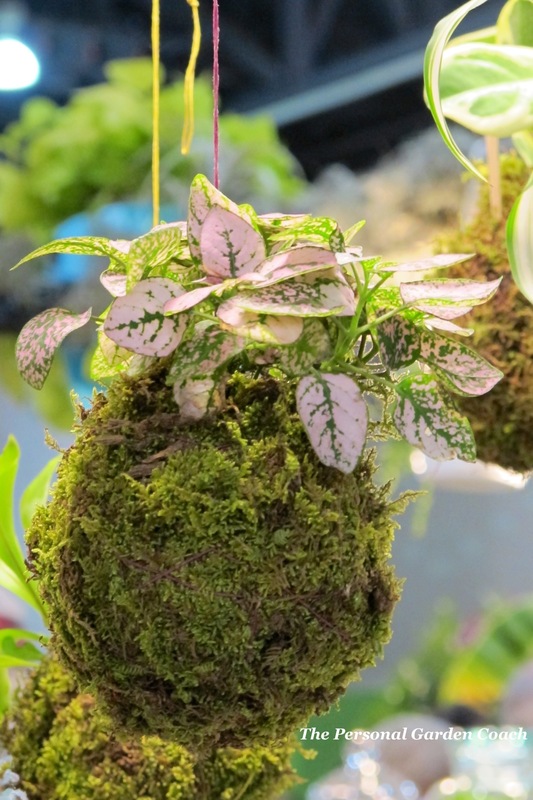 Essentially, these are a moss ball with a simple single plant featured on top and wrapped to hold together with fishing line or wire then simply suspended with a strand of string. I’ve seen them hung from jute twine, wire or a waxed twine as well. Plants options in the string gardens were varied to accommodate your light and moisture requirements, from succulents and herbs to ferns and polka-dot plants. If you would like to see a demonstration of how these are made, this post has some great directions. 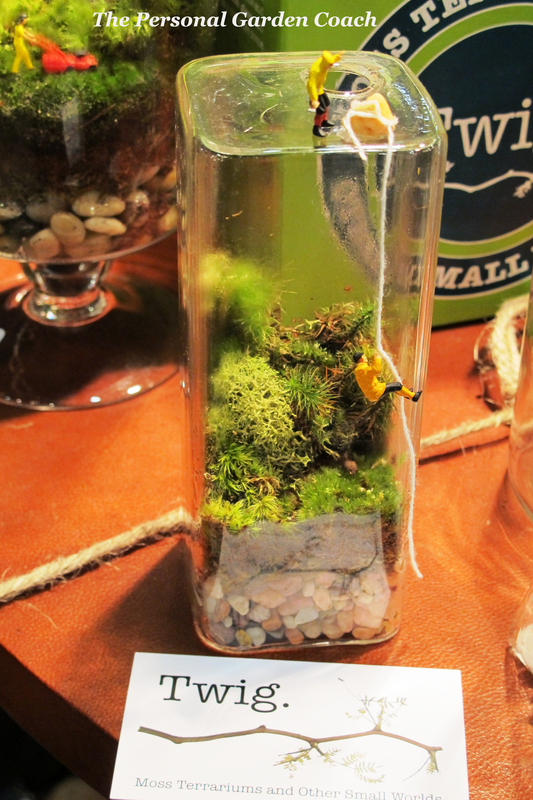 String Gardens were originally brought to us by Dutch artist Fedor Van der Valk. 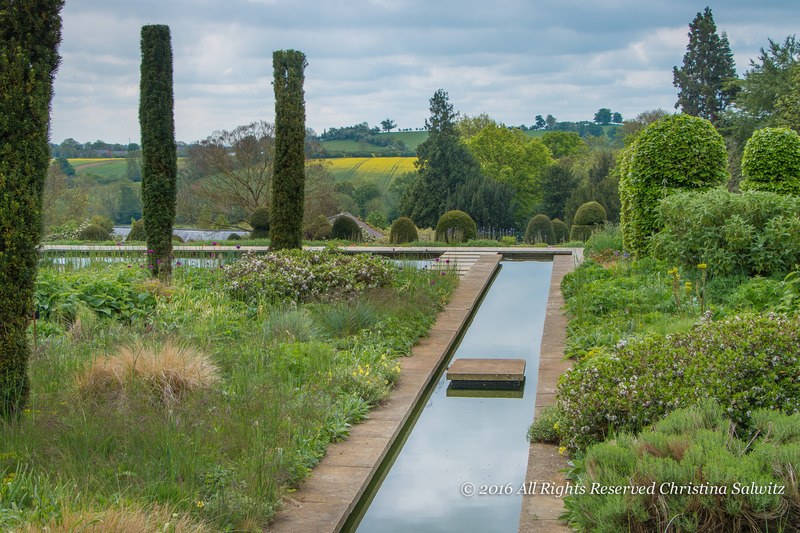 You can read more about the artist and see some fantastic photos of his creative suspended gardens in 2 articles from Garden Design Magazine written by Claire Lui. The first article posted in January of this year and then highlights posted again here in March 2012. 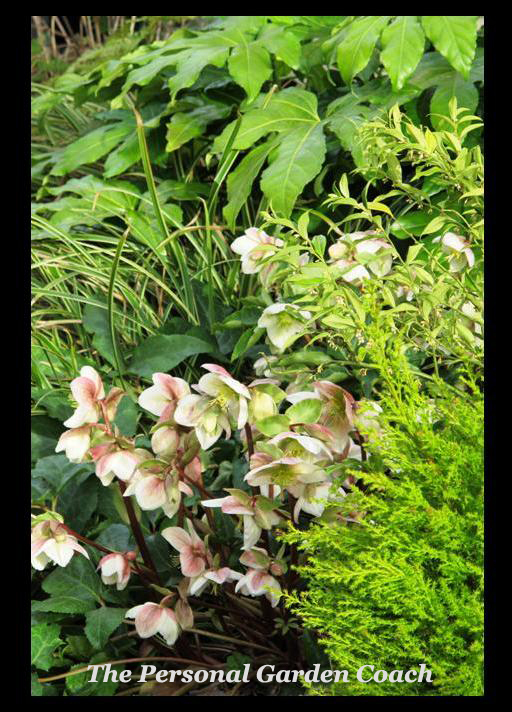 I was impressed at how varied the options were in the plants that they were offering in the string gardens. String Gardens are a fun and creative option for a plant craft to try that won’t cost a fortune. 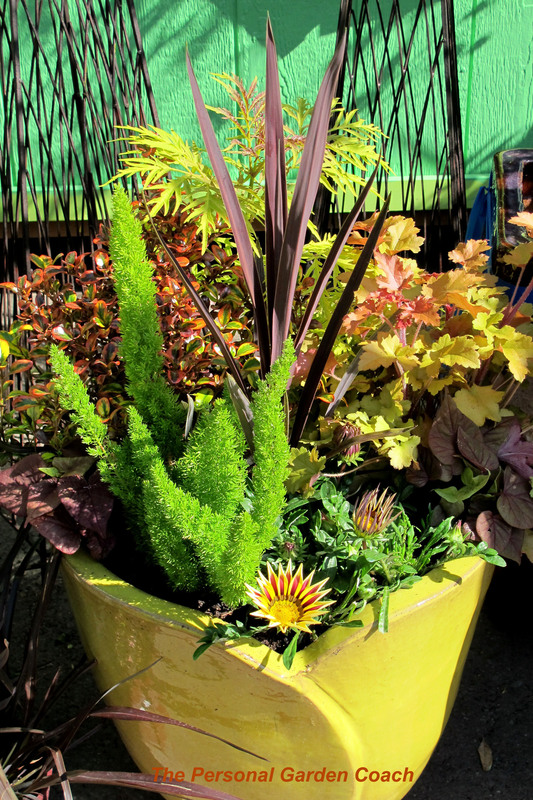 Imagine the possibilities of plants that you could try! 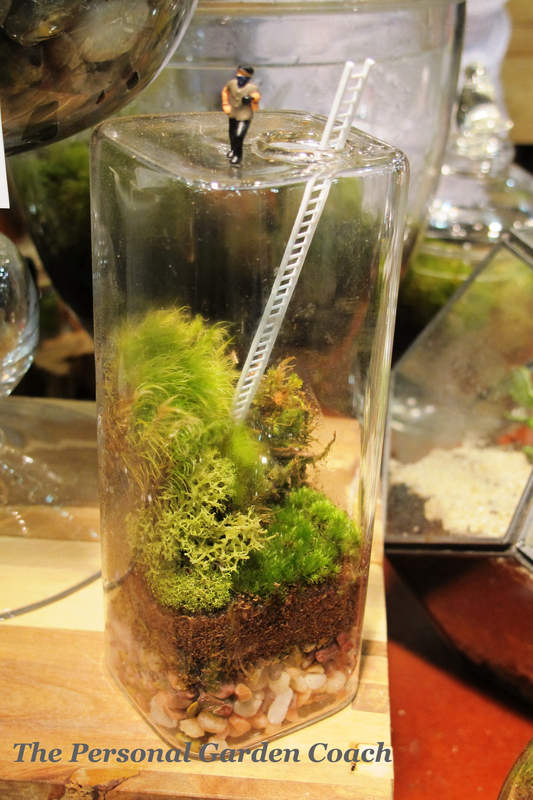 This popular show shop also offered some of the most sophisticated little glass terrariums I’ve ever seen. 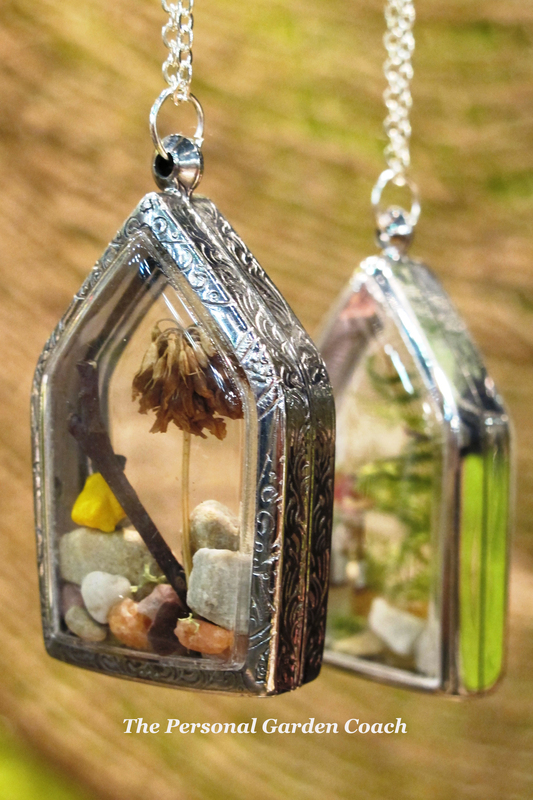 A rectangular glass box with an opening at the top for planting and a tiny hole in back to hang from a nail. 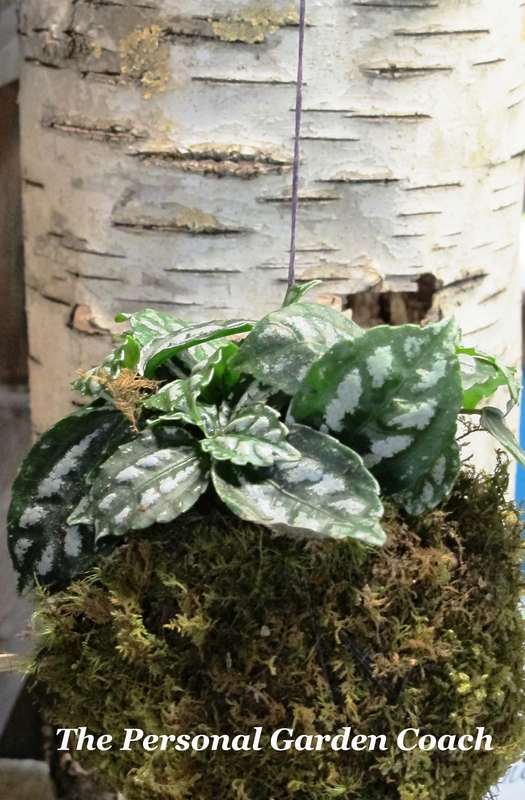 They had added some decorative rock in showy layers, some ornamental moss and a few air plants, voila! 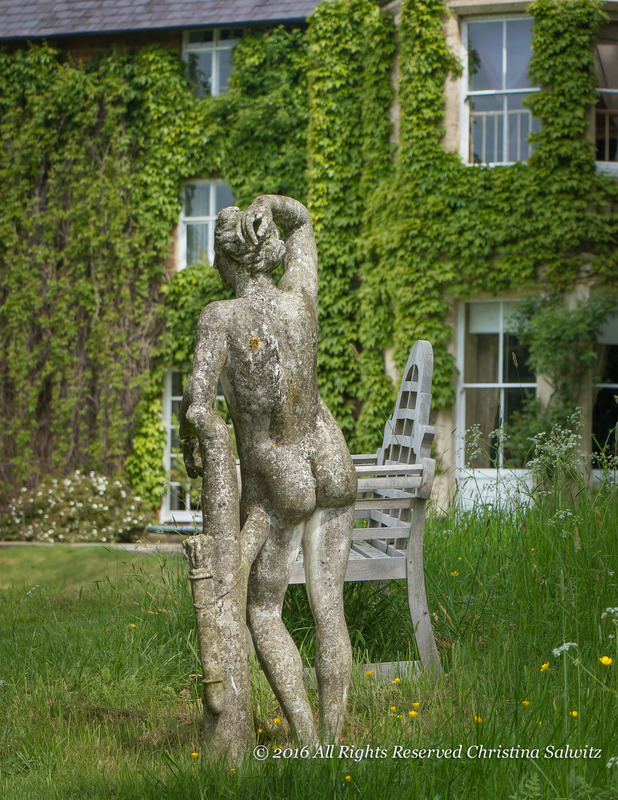 Any beginning gardener could easily keep this alive and in style too. Also among the fashionable offerings from City Planter were the extremely popular Moss Rocks by David Spain, as seen on Martha Stewart recently. Irregularly shaped, small ceramic rock shapes, glazed in trendy colors, sport a little tuffet of moss on top like a miniature crew cut. 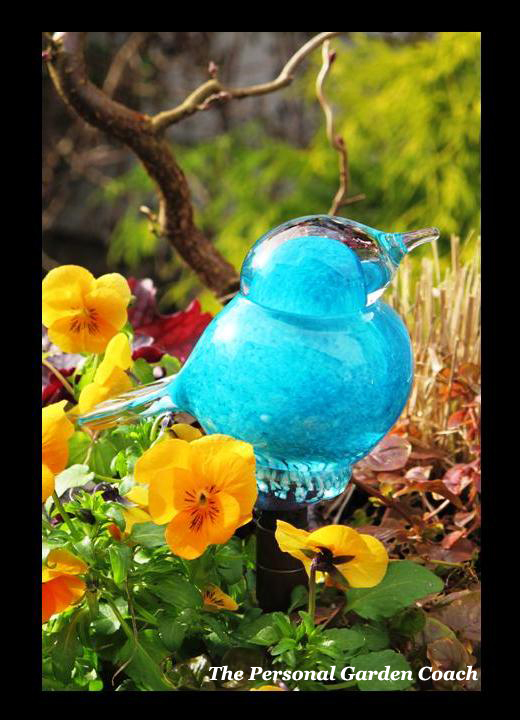 These charming, colorful living sculptures are an adorable little bit of Zen for your desk, counter top and coffee table. 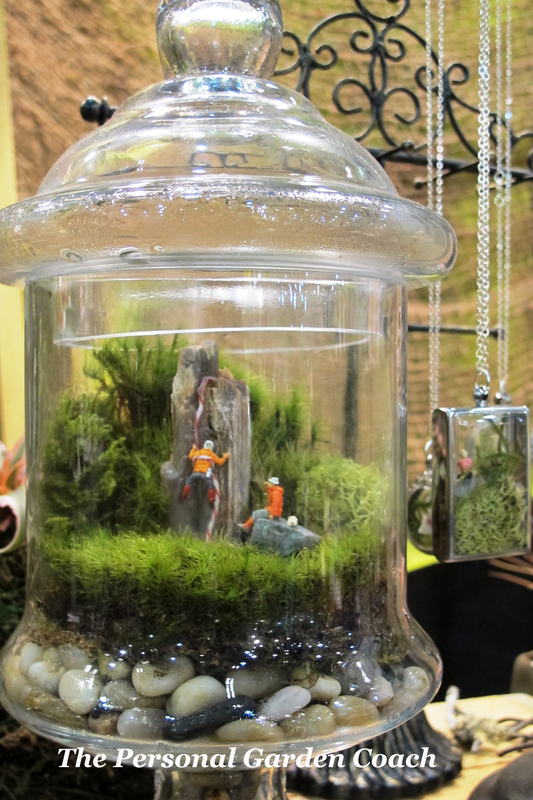 Chive.com offered a beautiful and sophisticated booth featuring simple design that shows off the beauty of the flower. 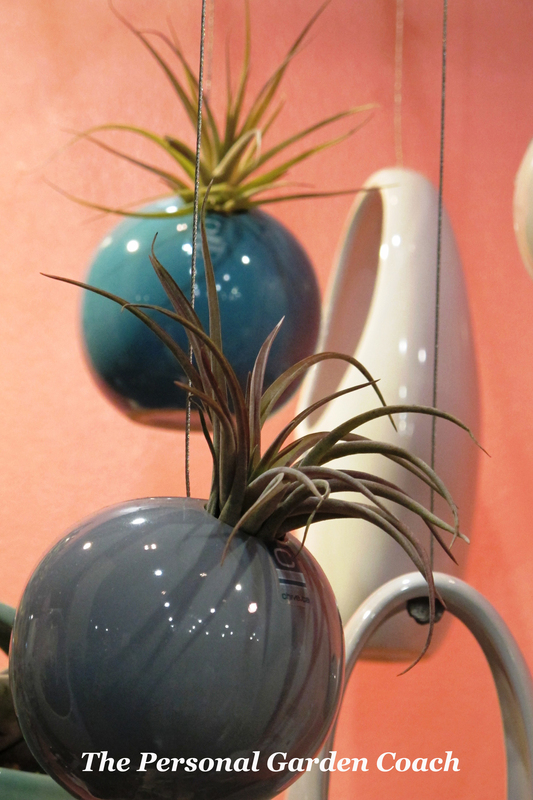 Hanging vases on a string were a very popular item as well as the ceramic 60’s style throwback hanging vases. 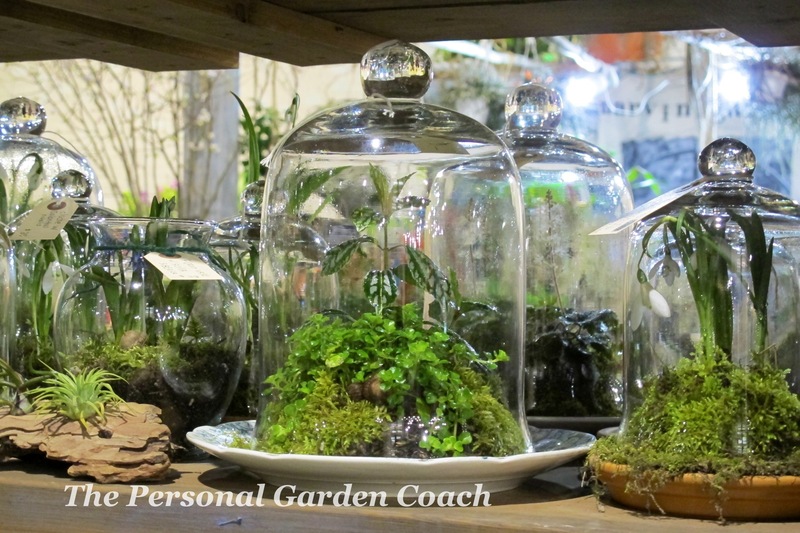 Cloches were also everywhere at the show, next to Terrariums these were one of the trends at the show that would draw the most passionate response that I would over hear from attendees. 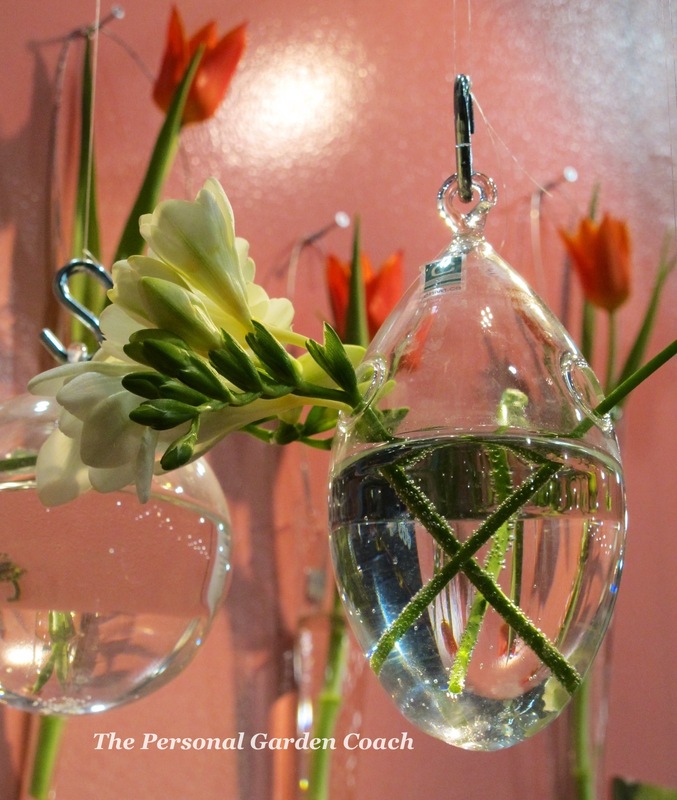 Cloches are easy to create and change a look on a table top in moments on a whim. 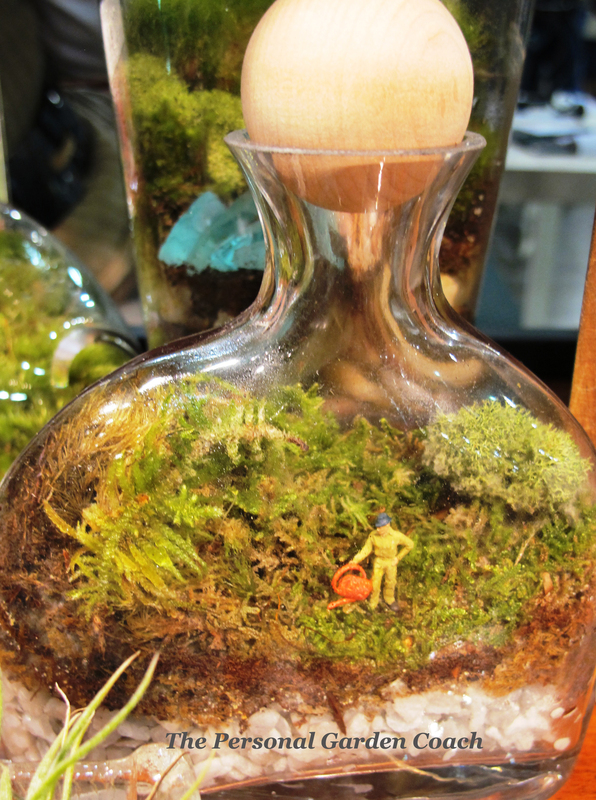 This lovely little cloche display was on only a small part of the charming and popular shop at the Philly Flower Show set up by Jerry Fritz and his team from Linden Hill Gardens in Ottsville, Pennsylvania. 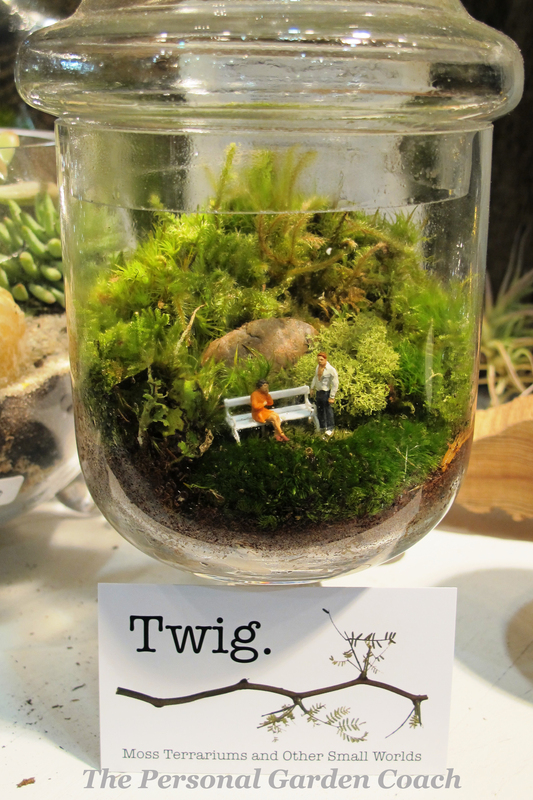 Possibly one of my favorite finds at the whole Philly Flower Show however was the booth from Twig Terrariums. 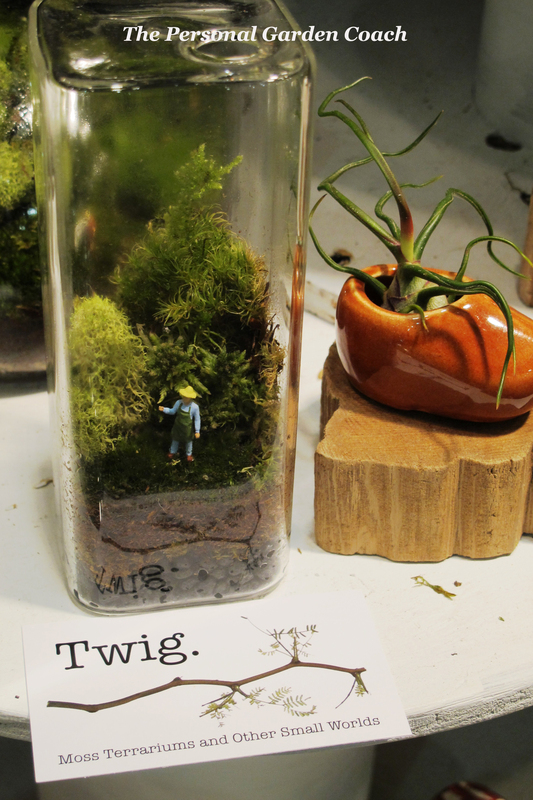 They not only had the String Gardens but the Terrariums and Miniatures were literally the ONLY ones in the whole market/vendor portion of the show and they were simply WOW! Each little world was depicting actions and characters not only in a terrarium environment, but in a completely new, contemporary light. I have truly never seen anything like it. It was enchanting to say the least. I’m not sure the pictures do it justice. Yes, I LOVED them THAT much. 🙂 If you want to read a great book about Terrariums, this one is beautiful! If you live in a marginally moist environment as we do here in the Pacific Northwest, you no doubt have Slugs and you might have Snails too. Here is an outline for the plan that I’ve devised for conquering them! A great link for some Slug and Snail basics here. 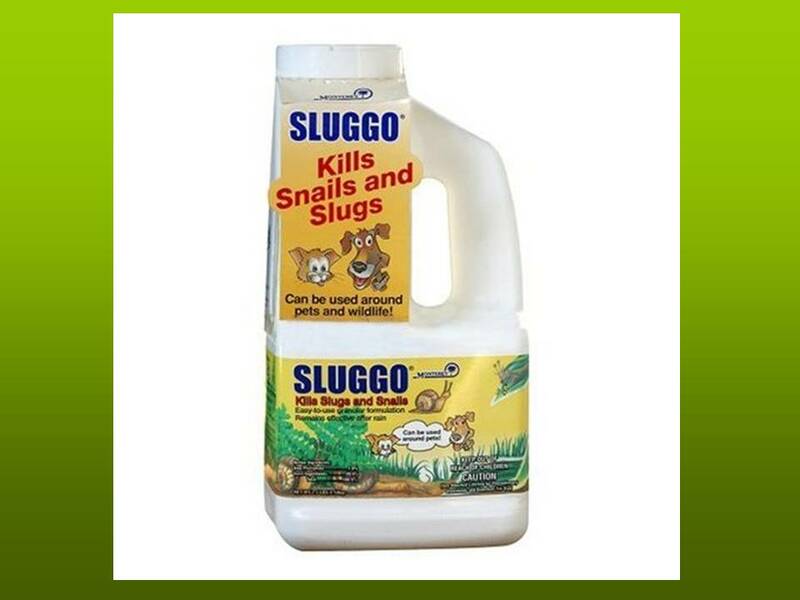 Applying your slug and snail product early in the growing season is key. Get the baby ones before they mature and multiply! Sluggo is the product that I use here at home. (I’m not being paid or compensated in any way to promote this or any item.) This is one of few snail and slug control products not based on metaldehyde. The active ingredient is a 1% Iron Phosphate that organically breaks down in the soil into fertilizer. It can safely be used around domestic animals and wildlife. This product is also labeled for use in vegetable gardens. Use your favorite pet safe slug and snail product early in the season. Ring the lawn, because one of the favorite egg laying spots is here so they can make a quick get away into the garden beds unseen by hungry birds. You want to get the babies when they hatch to be proactive in your efforts rather than after the damage is done! 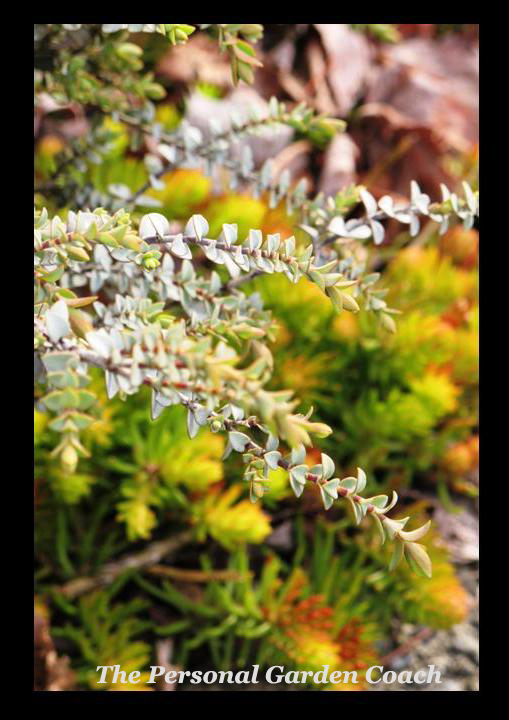 Also, sprinkle the little pellets IN ground covers, rockeries, paths and any moist hiding place. Hide them where they live NOT where they feed. A slug or a snail will commonly climb up into a woody shrub as the sun comes out and come back out as soon as it cools down. 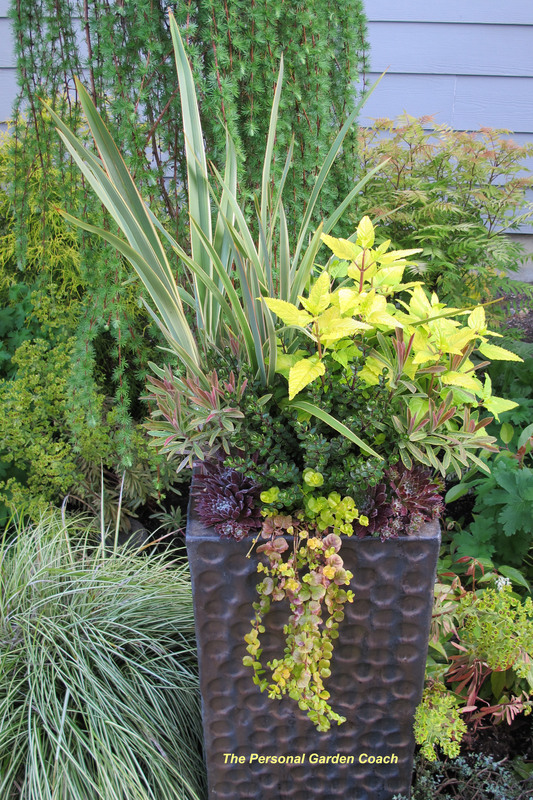 Place your product any place where it’s cool and moist or at the base of the shrubs and under the ornamental grasses. Remember this has a yummy scented bait! Slugs can smell for an impressive distance. If you bait where you DON”T want them to munch, you might kill a few of the bad guys, but you will also invite a bunch of your neighbors slugs to feast on your plants after the bait is gone. If you want to create a barrier that you CAN safely put around Slug and Snail buffet locations, use a product made of Diatomaceous Earth. I use this brand because it’s easy for me to find in a small quantity and it lasts forever. 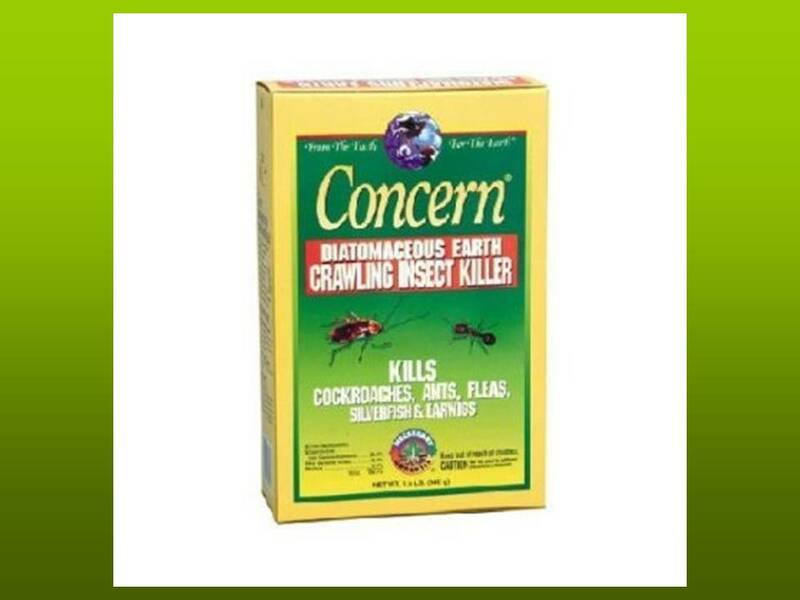 Concern is a crawling insect killer that harnesses the power of diatomaceous earth (85%). Made from the finely ground fossils of prehistoric fresh water diatoms, this product kills cockroaches, ants, silverfish, fleas and slugs. A long-lasting control, it sprinkles into cracks and crevices where bugs hide. Insects cannot develop resistance as there is no build-up of chemical immunity. Insects dies within 48 hours of contact. OMRI-listed and compliant for use in organic gardening. 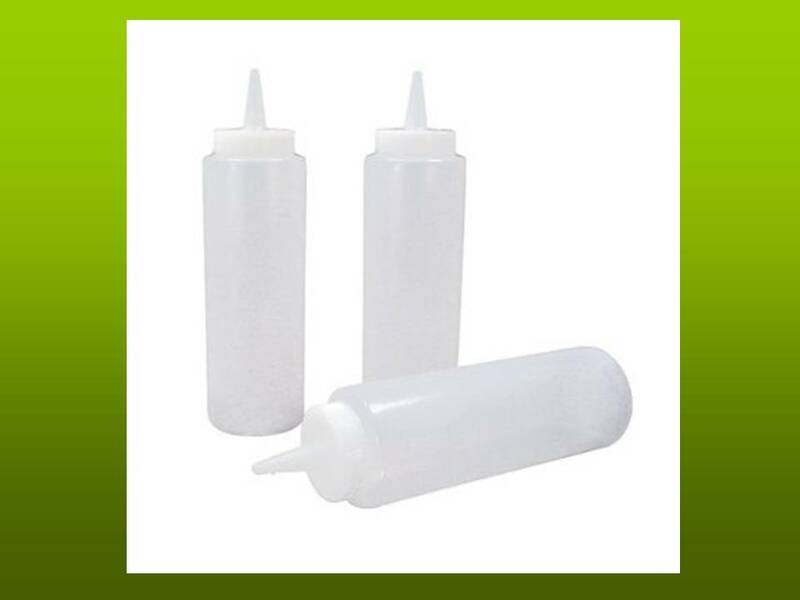 I use these little squeeze bottles, labeled “BUG DEATH”, to get the powder down in the cracks and crevices of leaves and rocks and around the base of plants. This is the equivalent of them trying to crawl through ground glass- I love it! However, as I said above the key is consistency. If it gets rainy right away, you will have to re-apply soon after to be effective. I usually pick a day every week during the moist part of the growing season and patrol the landscape with my little powder, which is also great for Earwigs too! Even living near MANY ponds and wetlands, I have successfully reduced the populations to more than tolerable levels in about 3 years. Now I only need to be applying when I have little trouble spots. *I am not nor have I ever been paid to endorse this product, I’m just a fan! Good luck and happy slug hunting! Surely Blueberry shrubs could be acceptable. They’re so pretty in Fall! Especially if I bake them a pie right? What about some Rhubarb? That can’t hurt if I have some strawberries growing underneath. Then they can have a Strawberry-Rhubarb pie! 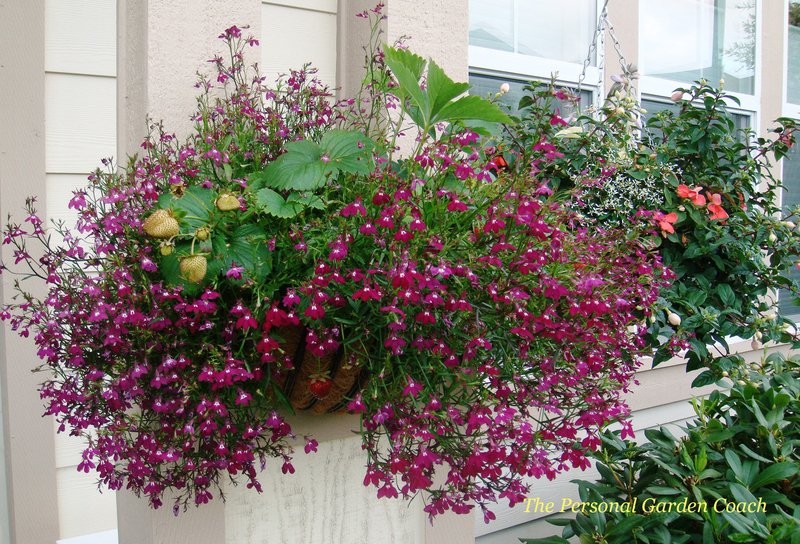 I could even have hanging baskets of berries growing on the porch. Certainly, the Lawn Inspector Generals can’t have a problem with that, right? Now, with the support of “The Germinatrix”- Ivette Soler and her brand new book called “The Edible Front Yard”, I have her chutzpah and encouragement to go for it! Ivette has written an entertaining and might I say, down right persuasive book for me to have the guts to stand up and plant my veggies, right here in my own front yard! Lawn Nazi’s be warned. I will not tolerate your irrational tyranny any longer. With Ivette’s brand of witty and passionate support, her book is lighting the way to create a front yard landscape that is elegant AND tasteful, in the best possible way! The forward in her book is written by Fritz Haeg, the author of “Edible Estates”. Fritz challenges us to be brave, go forth and conquer our fear of the neighbors downward glances and make the display of your edibles beautiful! 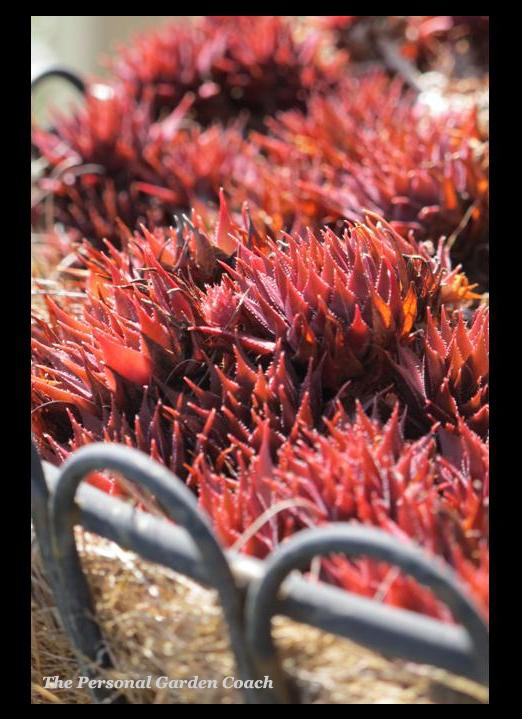 Ivette has gathered hundreds gorgeous of photos of gardens and plants in this book that help tell the story of distinctive and beautiful edible plants. 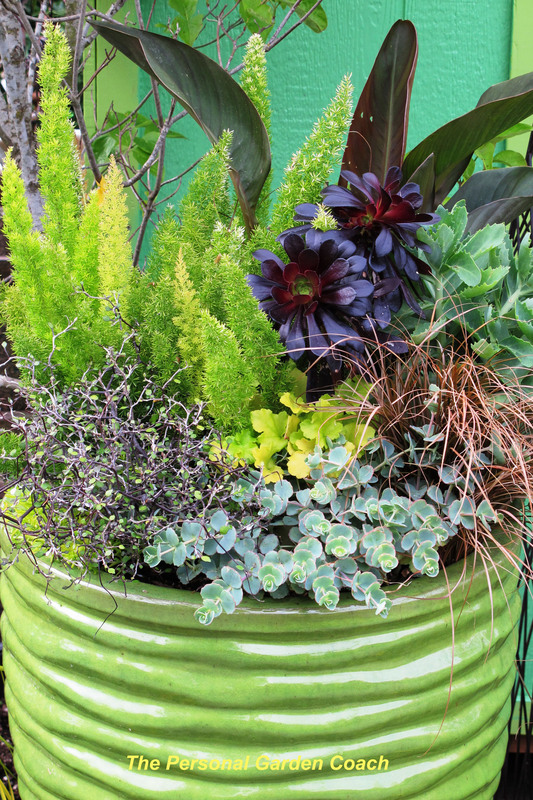 Photographer Ann Summa gets the bulk of credit, but there are also photos from edible gardening experts and designers from many varying locations. 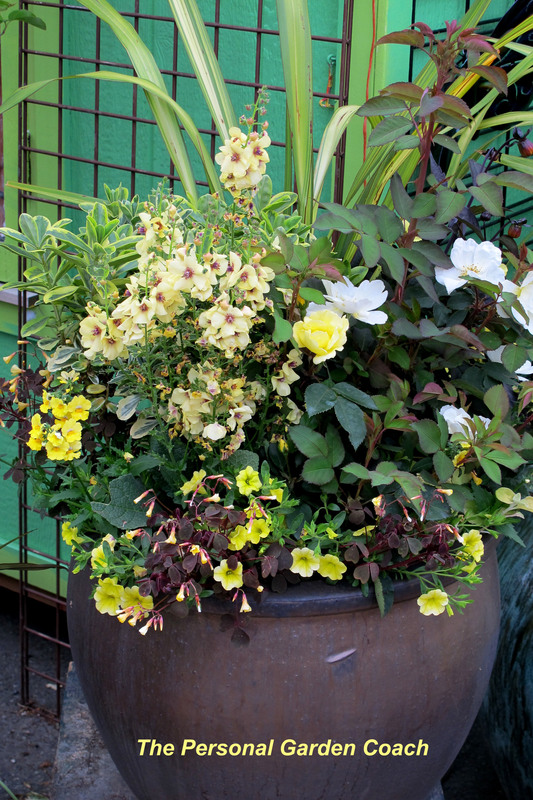 They give great example of aesthetic’s and variety of styles and ideas to springboard your integration of edibles into the face forward side of your landscape. The “Rules For Front Yard Edibles” on page 15, gives four guidelines to follow so that your edibles to rise to the occasion. The performance AND the beauty necessary for making the most of the design and devourables is paramount. 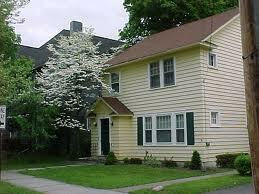 Ivette puts great weight on Beauty, Style, Regional Appropriateness, and your Home’s Architectural Style. Those are points that really ring bell’s with the neighbors and HOA so that they know you’re not going to be creating an eyesore. 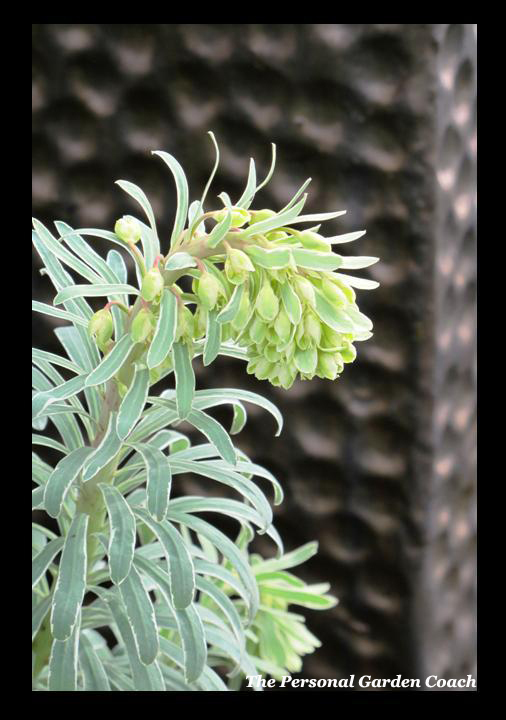 The book is chock full of suggestions for ways to add edibles to your landscape that follow the four guidelines. 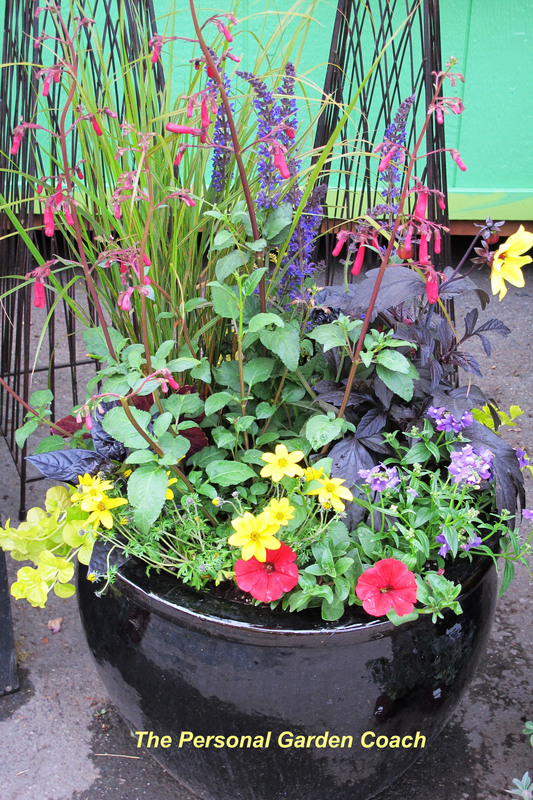 Plus a whole slew of plant suggestions and even design renderings that you can copy in your own garden! Fired up doesn’t even begin to describe how I feel about tackling this Edible Front Yard revolution! This book also has a great section on the Reality Check needed before you really get going such as, Climate, Boundaries, Grading, Structures, and Sunlight or lack of it. 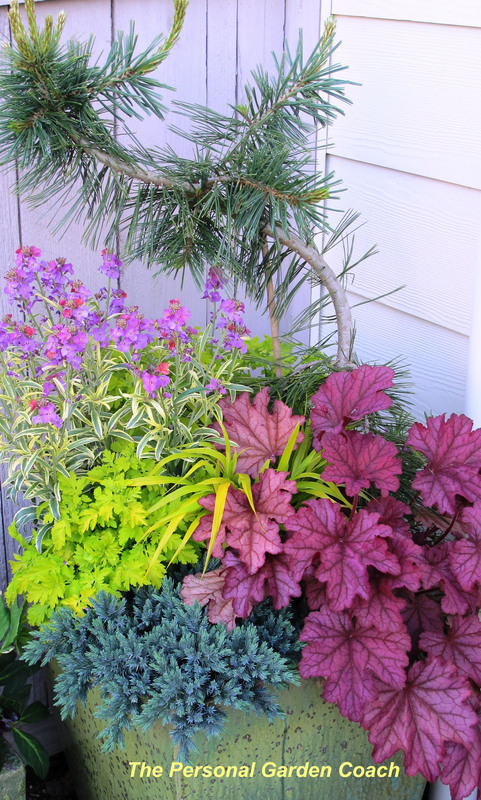 There are even some suggestions for shade edibles! 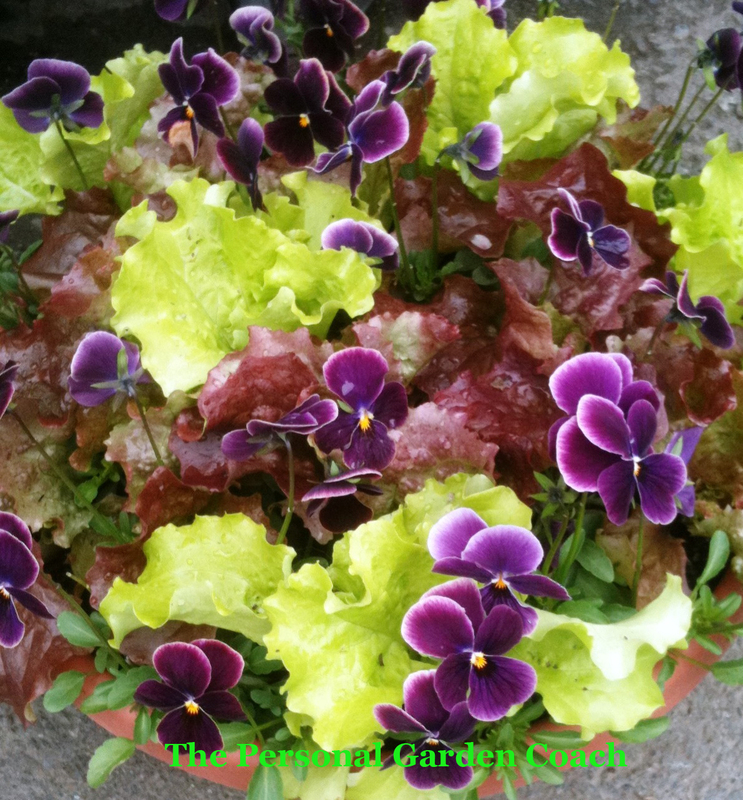 Red Sails Lettuce, Lemon Thyme, Hellebore, Jasmine and more! Of course it would be imprudent for me not to mention the VERY BEST part of the book – THANK YOU, Ivette and Timber Press, the column on page 131 about Garden Coaches!!!! 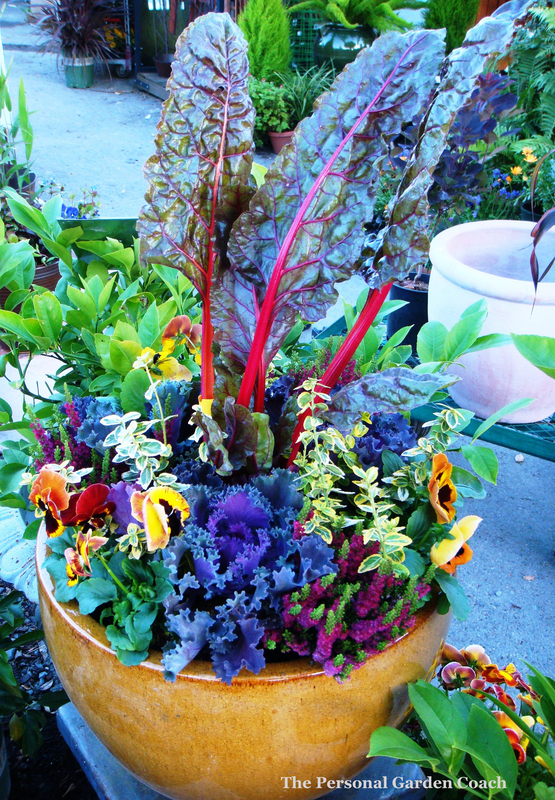 YES WE CAN be of great help to a gardener who wants to embark on this great new gardening adventure in eating. Saving you Money, Time and Labor is my specialty! 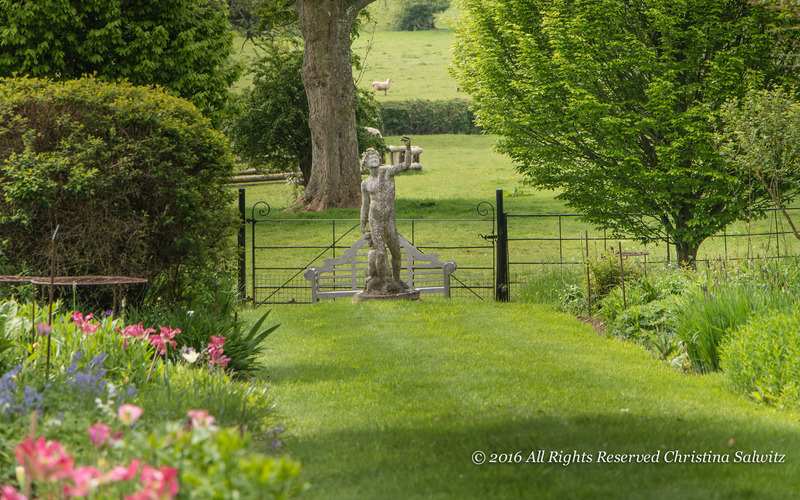 The chapters and sections that cover the removal and reuse of the lawn, working with existing trees and plants, making the most of hardscaping, and maintenance of your newly designed Edible Front Yard are fantastic! Ivette has written them with a green hand and responsible attitude for todays new gardeners. Setting an example for the neighbors and young passers-by is a truly noble ideal in this day and age. Worms, Compost Tea, Organic Pest Control methods are all topics that we need to be preaching from the top of the compost bin and Ivette has set in motion a beautiful means of doing just that! Eating out of your Edible Front Yard will not a be considered a subversive act anymore. Even Martha is talking about it! The Mayor of San Francisco has also turned a public space into a fruit and veggie bearing garden for all to enjoy. 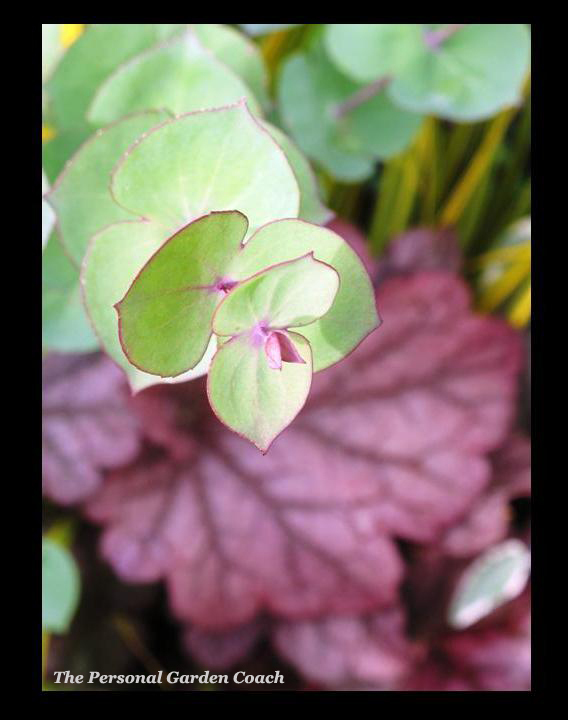 This can begin to transform a community, create great relationships with spectators and promote biodiversity that goes beyond lawn and Lobelia. Not to mention the financial and physical benefits of growing your own produce and staying in shape while you do it. 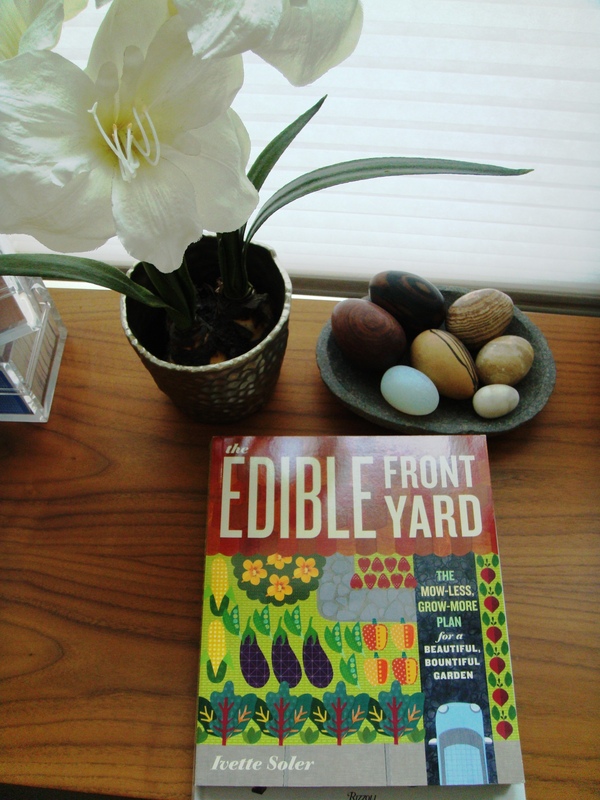 *Leave me a FABULOUS comment for a free book give away of “The edible front Yard Garden” – drawing on March 1st! !